Happy birthday to ankh_hpl and dqg_neal. May you enjoy a wonderful day today and many more to come! * Today StarShipSofa kicks off the first of several shows this week highlighting the short story finalists for the British Science Fiction Association Award. Today's episode includes my unabridged dramatic reading of one of the finalists, "Evidence of Love in a Case of Abandonment: One Daughter's Personal Account" by M. Rickert. You can download it here, listen to it streaming here, or get it via iTunes under "StarShipSofa." Stay tuned this week for more BSFA short story nominees! * Some of George Romero's early work included filming the "Picture Picture" segments for Mister Rogers' Neighborhood, such as the infamous "Mister Rogers Gets a Tonsillectomy" show. * Romero did not consciously plan for Night of the Living Dead to be the first major U.S. motion picture in which a black actor was cast as a non-ethnic lead; it just so happened that Duane Jones was the best actor who was interested in the part, and so Romero cast him without thinking his race was an issue. * Romero likewise did not intend Night of the Living Dead to be about the Vietnam conflict specifically, although it has been considered by many to be just that. 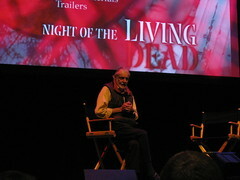 Instead, Romero saw the film as a larger commentary on humanity's inability to rise above petty differences and unite for a common goal, even in the direst of circumstances. At sixty-nine, Romero is a terrific presence: irreverant, enthusiastic, and clearly happy to be making his kind of movies. Rather than feeling typecast, he celebrates the fact that genre films allow him the freedom to present his messages in bold ways, as he sees fit. If you have the opportunity to hear him speak, I recommend taking it. "We may not enjoy living together, but dying together isn't going to solve anything." And your Mom is either also a dork or a dork enabler. I think I like her! How perfect! She is indeed a dork enabler. I'll have to tell her so. :) LOL! This is absolutely fantastic! I love it. Thanks for the link. 1) Huzzah for socially progressive zombie movies. 2) Thanks for the birthday well-wishes. Huzzah indeed! And I hope you have a fantastic birthday.